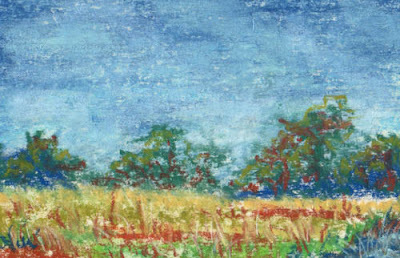 Impressionism has been popular for over a hundred years, while many other art styles have come and gone... why is that? I used to thing it was just the immediacy of the artwork, combined with the picturesque scenes painted by the original impressionists. Those are of course great reasons to love impressionism! 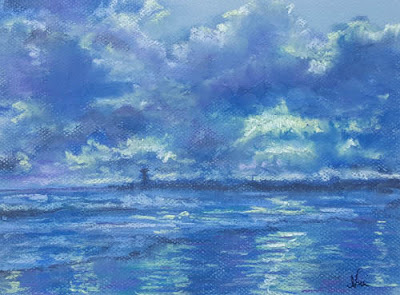 However, I enjoy a modern-day impressionistic scene just as much as those of the original famous impressionists. 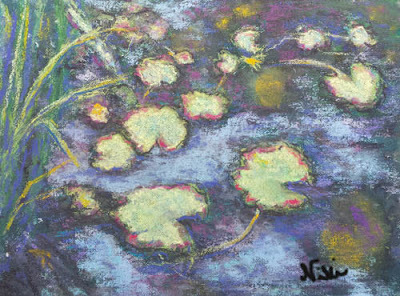 Of course, water lilies are just as amazing to observe and paint today as they were 150 years ago. Cactus seems to be everywhere in Southern California! It can be a nuisance or a blessing, depending on how you look at it. I have to be in a particular mood to draw or paint cactus-- it's got a lot of funny shapes and details. I see so much cactus every day I don't always think to paint it. 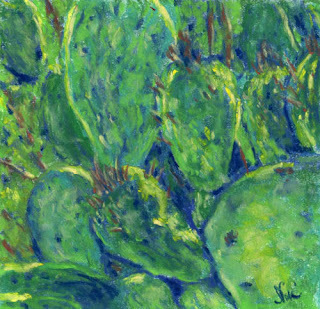 Having lived with a large patch of cactus near my house for many years now, I realized that although I may not take the time to paint it often, it really is an amazing plant. I've written about painting cactus previously, and the challenges I had this time were still the same. I've come to appreciate cactus more, though-- if I take the time to walk over and really look at it, there's always something interesting to watch. Pastel is so versatile, I like to use it on a variety of surfaces. One of my favorites is old parchment paper (courtesy of my late grandmother, who enjoyed calligraphy and creating her own Christmas cards). I saved the paper partly out of a sense of nostalgia-- I still have some of Grandma's handmade cards on similar paper. I also saved it so I could try the pastels on it, and it's become one of my favorite surfaces when I want to achieve a "scratchy" look to my pastels or focus on heavier drawn lines. If you're looking to try soft pastels on this type of paper, I have a few tips based on my experiences with pastel and parchment paper. We live in an age where we can spend our entire day receiving input from others, even without leaving the house or talking to anyone. We can read messages, articles, scroll through profiles and updates, or even turn on that old dinosaur known as the t.v. For me, there's also reading novels-- something I thoroughly enjoy but feel a little guilty indulging in when there are so many other things I should be doing. 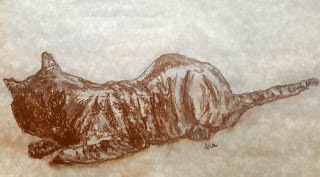 Add to that the time I spend listening to the birds outside, or gazing at the ocean, or drinking in the afternoon light on the oak trees, and there's very little energy left for output-- which in my case is painting or writing new things. And then there are the cats. They're very distracting, but they do provide me with a bit of creative inspiration. It's been quite a summer! 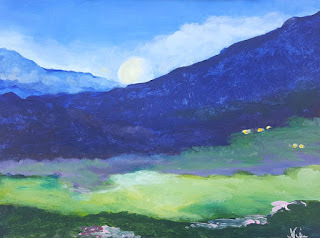 I'm now cataract-free and adjusting to the changes in my vision-- it was only one cataract, which caused a few months of cloudy vision, but it definitely had an effect on my attitude toward life and painting. We've had a strange summer this year: extremely hot June, a strong rainstorm in July, and a mild August so far. Being unable to see meant that I spent a lot of time home, which suited me fine as the traffic here seems to get worse every time I leave the house. The children were of course bored and bickering much of the time, but they seem to do that whether we're home or not. The summer definitely had its share of annoying occurrences. After a long hiatus, I'm trying to get back into a more productive cycle, which means more painting, creating lessons and teaching, and taking my work out of the house to events. It's not that I haven't been busy, but I've gotten sort of sidetracked with fun pursuits like gardening, sewing, and breaking up fights between my children. If you're in the North San Diego County or Southwest Riverside County area and would like to do a paint-sip event, please contact me for samples and prices at nicolehilsabeck@yahoo.com. When we're first learning to make art as children, we hear a few things that become familiar over time. Skies are blue! Tree trunks are brown, leaves are green. Butterflies are supposed to be perfectly symmetrical! Well, if you take a long look around you, you'll notice that most of that well-intended advice was wrong. Trees can have blue, purple, and green trunks-- or even red or yellow, depending on the lighting. Leaves can be just about any color too! Butterflies, while appearing symmetrical, aren't necessarily so if you look closely. 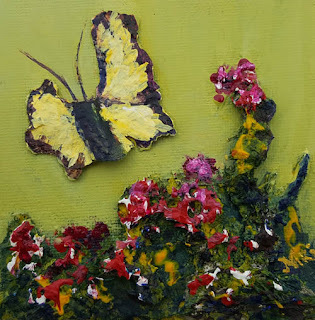 Most of the butterflies I paint from photos have damaged wings, which isn't noticeable to me until I take the time to examine the photos in detail. So why do we hear the same advice being repeated to kids over the years? What's the first question most people have when a child shows us a painting? "What is it supposed to be?"